Our first advert in the Celebrate:MK magazine – June edition. Telephone marketing is still one of the most effective ways to secure new business! We are looking to attract more new business for ourselves, locally. 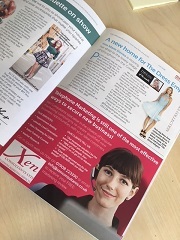 If you are exploring telephone marketing in-house or looking to outsource to the experts – Xen can help! Be human, be more successful! Why Telemarketing is the Solution to your GDPR Dilemma!